On June 1, 1913, Brothers Georg Hohnstein, Conrad Wacker, Ludwig Deines and Christian Baecker traveled to the Bethany community west of Cedar Mill to persuade Rev. Heinrich Hagelganz to lead a new congregation they planned to form. These men represented a group from the Free Evangelical Brethren Church who had become dissatisfied with the leadership and doctrine of that church. Rev. Hagelganz was pastor of the German Congregational Church of Cedar Mill at the time, but he felt a strong desire to help. After his arrival in Portland in 1906, Rev. Hagelganz became a member and Elder in the Free Evangelical Brethren Church. The men who came to him on June 1st were his Brothers in the Brethren church. Rev. Hagelganz encouraged reconciliation between the factions at the Brethren church, but when that effort failed he agreed to help organize a new congregation for the breakaway group. A group of 29 members from the Free Evangelical Brethren Church met with Rev. Hagelganz at the home of Melchior Krieger on June 22, 1913. The new church was formed as a part of Congregational denomination (apparently influenced by Rev. John Hopp) and was named the Zweiten Deutschen Kongregationalen Gemeinde (Second German Congregational Church), recognizing that Ebenezer was the first Congregational church of this denomination founded in Portland. All of the founding members were of Volga German ancestry. The following officers were voted into the controlling positions: Sunday School Supt., Georg Hohnstein; Deacons: Melchior (Mel) Krieger and Henry Lenhardt; Trustees: Georg Knippel, Conrad Wacker and Ludwig Deines. Secretary: Adam Bihn and Treasurer: Nicolaus Koehler. Rev. Hagelganz was officially called to be the spiritual adviser (clergyman and pastor) of the new congregation. On July 9, 1913, the newly organized church council was sworn in and the church was accepted as a united Congregational church. 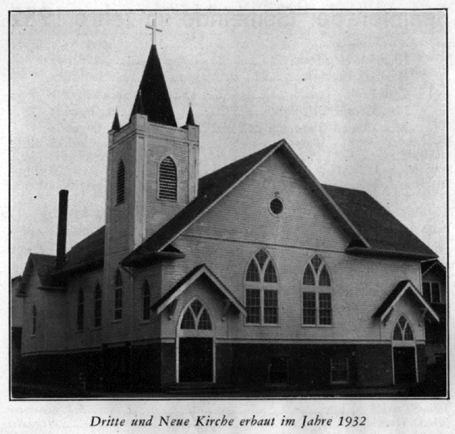 A vacant lot was purchased at corner of NE 8th and Skidmore for $1,850 and a house of worship (36 feet by 42 feet) was built in the summer of 1913 at the cost of $4,000. This was a large amount of money for a small congregation and paying the debt required sacrifices by the members. There were no wealthy individuals in the congregation at the time. Most of the men were garbage haulers, railroad workers or cabinet makers. If women worked outside the home, it was usually as a house cleaner or in other low paying jobs. Some people would often go without meals and denied themselves basic material items in order to make the church successful. The fledgling group made arrangements with a Seventh Day Adventist Church to use their facilities on Sundays as a place of worship until their new building was erected. This was the humble beginning of the faithful few who immediately inscribed their accepted motto over the chancel of their new church: "We Preach Christ and Him Crucified." The first church building built in 1913. The building is located at 918 E. 8th N. (now 4236 NE 8th Avenue). Pastor Hagelganz, with the approval of his new congregation, continued to live in the Bethany community, alternating his preaching time each Sunday between the two congregations until he moved back to Portland in 1915. According to the Minutes of the Congregational Conference of Oregon published in 1915, the congregation numbered 55 members in 1914 (31 males, 24 females and 25 families). There were 23 new members admitted during the year and 20 baptisms. John Weber is listed as the Clerk for the church. In the early days, the congregation followed the strict upbringing and men sat on one side of church dressed alike in white shirts without neckties, which were considered an outward adornment and women sat on the other side. All services were conducted in the German language. The United States declared war on the German Empire on April 6, 1917 which created an uncomfortable situation for the congregation who had no direct connection to Germany other than their native language. The community was under the watchful eye of government officials who sometimes attended church services, seated in the back row, to monitor the what was being said. During World War I, Rev. Hagelganz received an annual salary of $750 and provided his own living quarters. If it were not for the fact that his daughter, Mary, held an office job in the shipyards earning twice his salary, it would have been difficult for the family to survive. Membership in the congregation increased rapidly during the first eight years with more people arriving from Russia, Canada and the Midwest. This growth enhanced the viability of congregation. In 1918, the Minutes of the Congregational Conference of Oregon show 119 members (64 males, 55 females and 55 families). There were 21 people admitted as members during the years and 14 baptisms. Ludwig Miller is recorded as the Clerk for the church. Rev. Hagelganz reports: "The Second German Church has been progressing nicely. Since January the 1st 1918, 14 new members have been added to the church. Spiritual life is active. Services are all well attended. Trusting in the Lord we are going forward, knowing He is faithful. He has promised never to leave his own." The church building soon became too small and expansion plans were made. 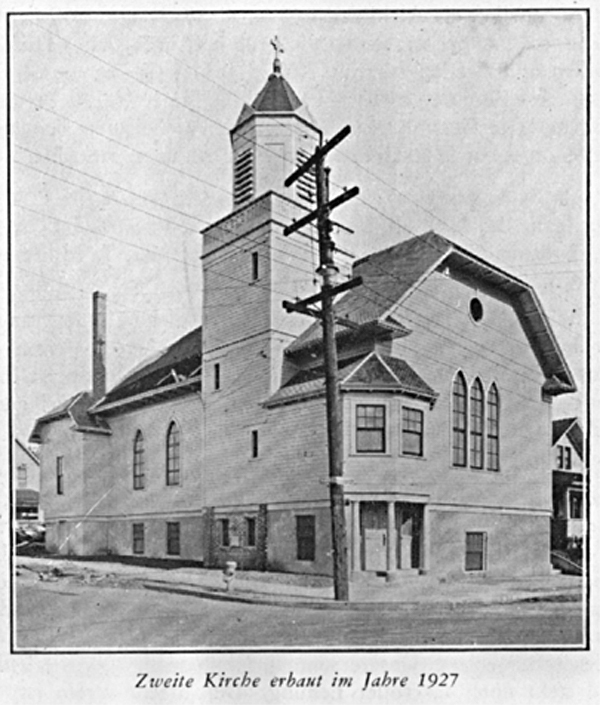 In 1921, the main sanctuary was enlarged by 30 feet, increasing the footprint to 36 feet by 72 feet, and a basement was placed under the entire building to accommodate the growing Sunday School. The total cost of this remodeling project reached $7,500 of which the contractor provided a grant of $1,000 and a $1,700 loan. 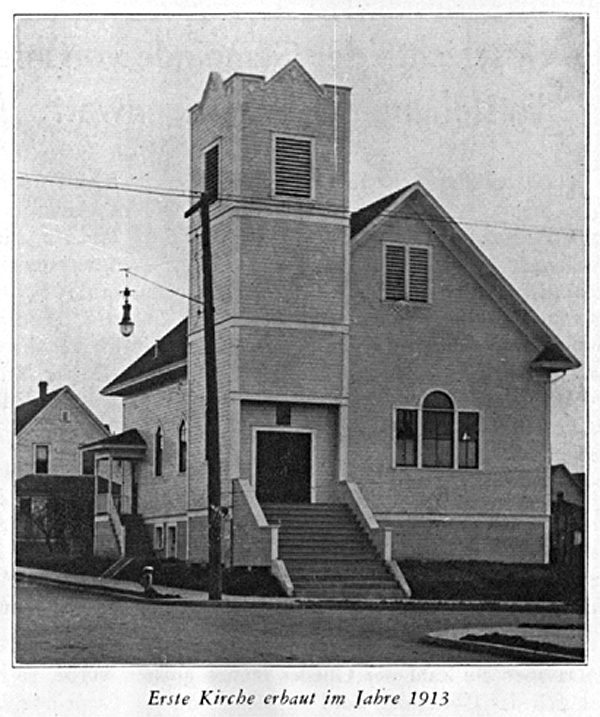 Photograph showing the expansion of the church completed in 1927. By 1927, the church had grown substantially and was firmly established. The Ladies Aid Society, which was organized by the fall of 1913, started with only 12 women and grew into a very large group. The Sunday School that was initially organized with 30 members grew to 250 members by 1927. The Christian‑Endeavor, which totaled 25 members when the church was organized, expanded to 100 members by 1927. In 1927, Rev. Hagelganz was called to serve a church in Fort Collins, Colorado. Rev. H. G. Zorn was called to replace him. That same year, the congregation purchased the parsonage adjacent to the church at a cost of $4,100. The entire property of the congregation then consisted of a 100 foot by 100 foot parcel of land. During Rev. Zorn's term (1927-1929) the congregation lost 60 members. Pastor Zorn resigned in the spring of 1929 and was replaced by Rev. Hagelganz who returned to his flock in Portland. Rev. Hagelganz accepted the position on June 1, 1929. From June 1929 to June 1930, the church gained 66 new members. The sanctuary needed to be enlarged again and a decision was made to accomplish that in July 1932. This is remarkable given that the country was in the midst of the Great Depression at the time. The project began on August 1, 1932 under the leadership of Henry Miller as architect and L. A. Wick with O. M. Martinson as the builder. The church was enlarged by adding 22 feet to the south side which increased the building footprint to 58 feet by 72 feet. The enlarged sanctuary, which included a new balcony, had seating capacity for 600 people. This new addition cost $8,000. The building committee consisted of the following persons: Rev. Hagelganz, H. Wolf, P. Emmert, John Miller, Phil. Sittner, D. Metzler, John Schleuning, J.A. Krieger, Henry Schneider, John Mueller and George Mill. An 8‑set pipe organ with chimes was acquired by the Junior Ladies Aid and the Christian Endeavor group from the Guenther Organ Company of Portland, Oregon for the low price of $2,000. In normal times, the cost of the organ would have been twice as much. The third expansion of the church completed in 1932. War with Germany again created an awkward situation for the congregation, but by 1945 the ethnic conclave was much more integrated into the American way of life and many church members served proudly in the armed forces. Despite the fact this group had no allegiance to Germany as a nation (their ancestors had left this part of Europe in the 1760's) and some families had lived in Portland for 64 years, the community was again under surveillance by the federal government. The younger generations, who had assimilated into American society much more than their parents and grandparents, were eager to worship in English rather than the German language. This tension within the church and community had to be addressed to hold the community together. Near the end of World War II, it became evident to Rev. Hagelganz that the use of the English language must be incorporated into the worship services to reach the youth of the church. Rev. Hagelganz could speak English, but he found it difficult to preach in this language. The congregation agreed to employ the services of William (Bill) Koenig, who would deliver a 15 to 20 minute message in English at each Sunday morning service while Rev. Hagelganz would preach an equally long sermon in the German language. Hymnals in both languages were made available and the choir sung both an English and German anthem. 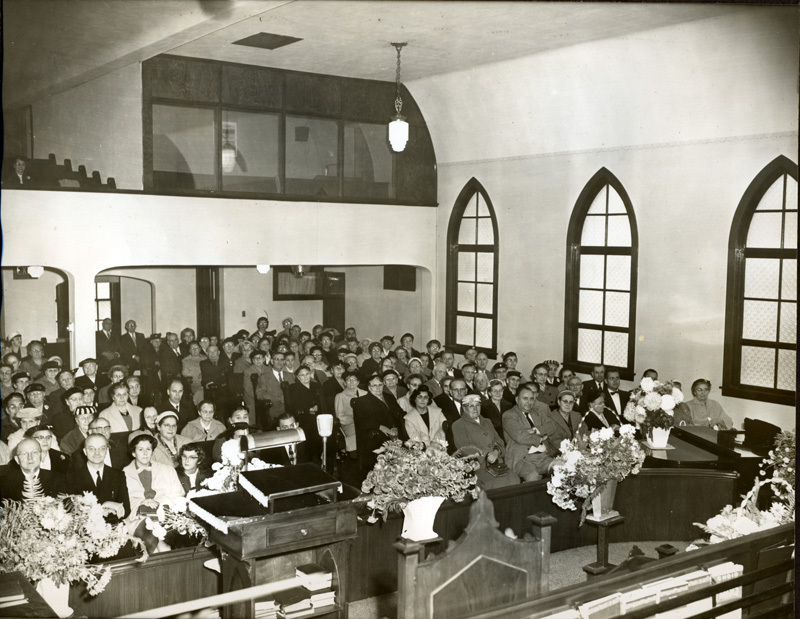 Over the years, the congregation became known as the "Singing Church", due to the many fine singers and talented musicians who were led and encouraged by Rev. Hagelganz. 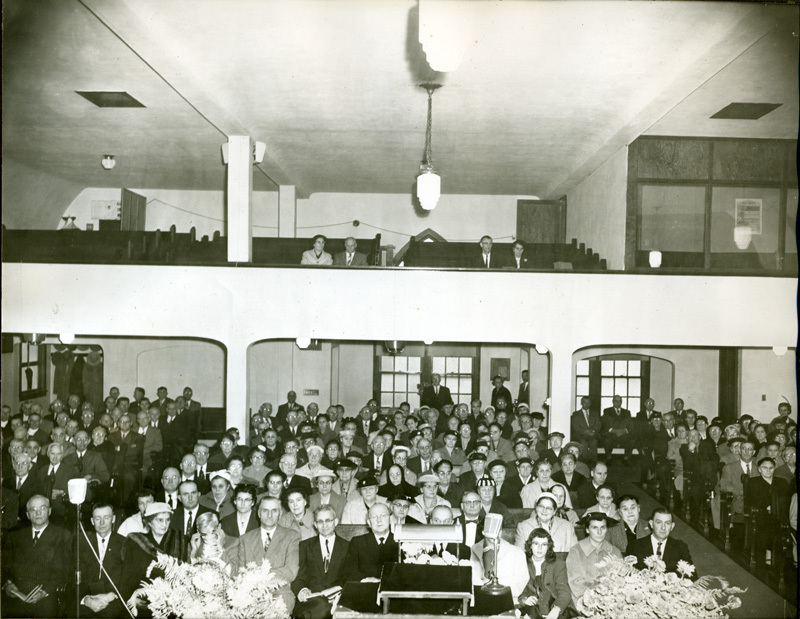 The Radio Club of the Second German Congregational Church was a very popular program in Portland and the surrounding area during the 1940's and 1950's. The half hour program was broadcast on KWJJ every Sunday evening from 9:30 to 10:00. Vocal music by choir members was followed by an inspirational message by Rev. Hagelganz. 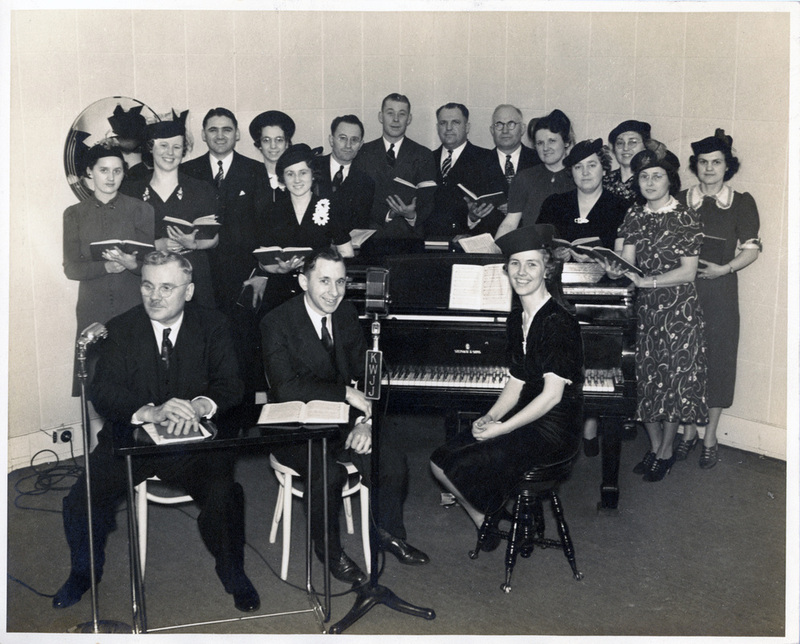 The Radio Club of the Second German Congregational Church of Portland, Oregon in 1941 during their Sunday night radio program which was broadcast on KWJJ. Back row from left to right: Mrs. J. Schnell, Mrs. H. Ehrlich, Mr. H. Ehrlich, Miss A. Mill, Miss E. Stricker, Mr. E. Flaig, Mr. G. Helzer, Mr. J. Miller, Mr. J. Kammerzell, Mrs. G. Glanz, Mrs. J. Miller, Mrs. E. Flaig, Mrs. H. Burback, Miss E. Greb. Front row from left to right: Rev. H. Hagelganz, Mr. William Krieger, Mrs. G. Helzer. Photograph courtesy of Loretta and Harold Kammerzell. Before his death, Rev. Hagelganz saw in advance a trend toward liberalism in the Congregational denomination and the possible merger of fundamental churches with non-fundamental groups who did not share common views. He warned and instructed the congregation about these changes. As a result of his careful groundwork, the congregation would later vote (unanimously) not to remain in the Congregational Conference. Sorrow struck the church family on Sunday, January 23, 1949, when just a few minutes before the hour to start the morning worship service, Pastor Hagelganz suffered a heart seizure. Six days later on January 29th, the Lord called him home to his eternal reward. His loss was keenly felt, not only in his own church, but in the entire Congregational community where he had become known and respected as a fiery gospel preacher with a deep passion for lost souls. A call was sent to Rev. J. S. Gyorog of Kelowna, British Columbia, which was accepted in October of 1949. He served the church faithfully for 8 1/2 years until he was called to serve the Ebenezer church. During his pastorate the membership voted to remodel the chancel by lowering the choir loft, building a new pastor's study, and changing the platform in general. The Vanport flood of 1948 resulted in the relocation of the African American population in Vanport (about 25 percent of the 40,000 inhabitants) to the Albina area. These people were not given a choice to live in other parts of Portland because of "redlining" practices. The term is said to have received its name by bank officials that would hang up maps and draw red circles around minority neighborhoods to avoid investing in them. The City of Portland did not challenge this practice. The rapid change in the racial mixture of Albina created tension in the community causing some members of the church relocated to East Multnomah County. It became evident that if the congregation wanted to remain intact, it would also have to relocate. In 1952, the membership voted to purchase two acres of land at NE 55th and Alberta for a future building site. With the beginning of construction of the Memorial Coliseum in February 1959 and the significant displacement of many people in the community caused by the Interstate 5 project through Portland in the late 1950's, the old Volga German settlement area in Albina began to further fragment and spread out to the eastern suburbs. In 1957, the church voted to become independent of the main Congregational denomination. Rev. Gyorog completed his ministry as pastor of the church on Easter Sunday of 1958. Shortly after Rev. Gyorog resigned, the congregation decided to rewrite and translate the Constitution from German to English and have copies printed in sufficient quantity so that every member could have a copy to study and better understand the cardinal truths upon which the church was founded. A call was sent to Rev. Fred Heydel who was ministering in San Gabriel, California. Rev. Heydel accepted the call and began his ministry in August of 1958. In June of 1959, the congregation voted to build a new parsonage on the site purchased at NE 55th and Alberta. The old parsonage was then used to provide additional space for Sunday School rooms. In 1960, with more people moving to the suburbs east of Portland, the congregation held a very difficult and emotional meeting where they voted to put the property up for sale and relocate. The church was sold to the Allen Temple Christian Methodist Episcopal (CME) Church, a primarily African American congregation, for the price of $45,000. Architect Don Eby of Vancouver, Washington (the founder of LSW Architects) was hired to design a new church. A groundbreaking ceremony was held in January 1961. It was a momentous occasion held on a beautiful sunny day in the midst of a season of inclement weather. The last service was held in the old church on the last Sunday of April 1961. During construction of the new church, regular services were held at the Cascade College Chapel. The last service at the Second German Congregational Church was held on Easter Sunday, April 30, 1961. Photograph courtesy of Joanne Krieger. The new church was substantially complete and ready for occupancy by September 1961. A dedication ceremony was held on October 8, 1961. The Rev. D. K. Schmidt of Walla Walla, Washington spoke at the morning service, and the Rev. James Hagelganz (the grandson of Rev. Heinrich Hagelganz) addressed the afternoon service. By congregational vote the name of the church was changed at this time to The Evangelical Congregational Church. There were approximately 200 members in 1961. At this time all church services were conducted in English. Following the counsel provided by Rev. Hagelganz before his death, the church voted not to become part of the United Church of Christ. The membership instead chose to remain a free and independent Congregational church. 40th Anniversary Second German Congregational Church 1913-1953. Portland: Second German Congregational Church, 1953. Print.